Willem Dafoe | WHAT A FEELING! Mississippi Burning is a big, ungainly picture that crashes into a mess of important and powerful issues. Waving his broad brush again is film director Alan Parker, the maker of Angel Heart and Midnight Express, who brings a heavy hand to all his movies. This time Parker is telling a story based loosely on fact, of an FBI investigation of the disappearance of two white civil-rights workers in a small town in Mississippi in 1964. (They were murdered by the townspeople, as a prologue shows.) The story unfolds from the point of view of two mismatched FBI men on the case. Thus it is yet another treatment of racial injustice in which the main characters are white, not black. However, this doesn’t mean the movie’s an automatic sell-out. More troubling is that Chris Gerolmo’s screenplay uses the FBI agents as representatives of opposing viewpoints, and makes a buddy story out of it. Gene Hackman plays a Southern-born agent who believes in sliding gently into the investigation, not rocking the boat, and using underhanded tactics if it means getting to the truth. 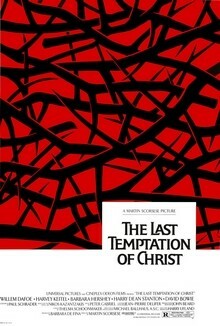 Willem Dafoe, last seen essaying the title role in The Last Temptation of Christ, plays Hackman’s opposite number. He’s a Kennedy liberal, straining to change the world, and doing it all according to bureau policy. Like the army of FBI men who swarm over the small town, he’s always seen in his narrow black tie and suit. These two carry on a somewhat predictably testy relationship. The movie never quite seems to know how to view them; at first the gung-ho Dafoe is as much a subject of derision as the local bigots. And the movie encourages us to root for Hackman’s outside-the-law methods, because the end apparently justifies the means. 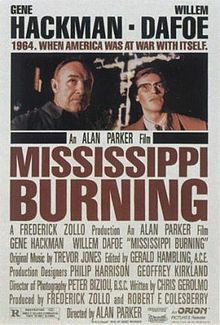 Mississippi Burning is important, and potentially potent, material. 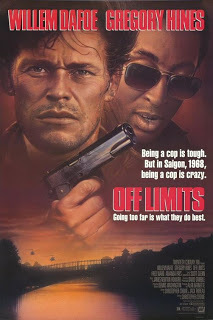 But Parker reduces much of the conflict to cartoon proportions; all of the townspeople, including the sheriff (Gailard Sartain, a tobacco-chewing veteran of the Ernest movies) and deputy (Brad Dourif), look like the moronic results of heavy inbreeding. The one multi-dimensional character is the mayor, played by Lee Ermey, Kubrick’s hysterical drill sergeant in Full Metal Jacket. Parker’s cartoon approach trivializes the significant issues here; although, in spite of this, Mississippi Burning does splatter some of its dramatic targets. It’s an obvious film, but the sheer weight of Hackman’s humanity keeps it in touch with some kind of reality, and his relationship with the deputy’s wife (good performance by Frances McDormand) creates the film’s most complex element. The movie already won over the National Board of Review, which named it the best picture of 1988, and it’s expected to be nominated for some Oscars. All of which goes to proves that if you bang people over the head with something, you will get their attention. A lot of people seemed to fall for the movie, which is still puzzling (it has a high rating on IMDb even today). It got seven Oscar nominations, winning for Peter Biziou’s cinematography. Almost 20 years later, Stone’s time has come. His new film, Platoon, tells the straightest, truest Vietnam story of any film yet. He served 15 months as an infantryman in the war, was wounded a couple of times, and won the Bronze Star. The movie is about the kinds of men he served with, and covers a year’s service through the eyes of a raw recruit. From the opening images of Chris Taylor (Charlie Sheen) arriving in the yellowish haze of Southeast Asia, the film tracks the relentless march of his platoon. Harrowing jungle attacks are alternated with rests at base, until the year is over. In its gritty, riveting action, Platoon is reminiscent of such classic war movies as Samuel Fuller’s The Steel Helmet and Anthony Mann’s Men in War. But Stone has also provided a mythic backbone to Taylor’s coming-of-age story. It lies in the good vs. evil struggle between two sergeants in the platoon—”Homeric gods,” as Stone has described them. Barnes (Tom Berenger) is brutal and amoral; “Our Ahab” Taylor calls him at one point, when the platoon destroys a My Lai-like village in insane retribution for sabotage, the film’s most horrifying sequence. 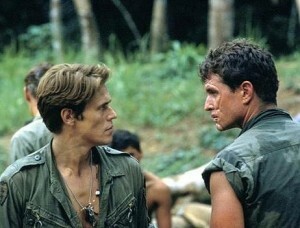 The other sergeant, Elias (Willem Dafoe), is poetic, almost divine. Despite the differences between them, however, Stone draws no simple conclusions. Barnes may be a black presence, but he repeatedly proves himself a good soldier who saves the lives of his men. The entire film sustains this ambiguity. Platoon is no easy anti-war screed; Stone knows the issue is too complex for that. There are no cheap shots here—even the generals, the apparently lily-livered lieutenant and the kill-happy grunts have their moments of self-realization. They are all at sea in this nightmare. Dafoe, previously stuck with playing villains (as in To Live and Die in L.A.) because of his stark features, is superb as the angelic Elias. He brings an odd mystery to the role, a hinting at past unspoken experiences that give shading to his heroic character. With all Stone’s capacity for subtlety, he also has a tendency to go too far. This was more evident in last year’s vivid Salvador than here, although it might be said that the narration in Platoon, in the form of Taylor’s letters home, may state too much that has already been shown. But for the most part, the film is a personal triumph. Stone can use it; since winning the best screenplay Oscar in 1977 for Midnight Express (a movie directed by someone else), he’s wandered around the Hollywood fringes. Now, via the circuitous route of his own past, he seems to have finished his odyssey. I haven’t seen the film in a long time, although I recall getting to see it twice before I wrote about it. Stone was never this on-point again, but I continue to have a soft spot for his excessive tendencies—the grandness suggested in the opening quote. When I interviewed him (he did a press tour in Seattle for World Trade Center), he was pleased that I appreciated The Hand, his pre-respectability horror film, which somehow did not surprise me. Platoonis small and big at the same time, a tricky act, passionately achieved.